The Tallinn Guitar Quartet was formed in 2005 at the Estonian Academy of Music and ever since has become the leading guitar quartet in Estonia. The quartet’s repertoire comprises both compositions of old masters as well as contemporary works (Bach, Telemann, Pachelbel, Rodrigo, Granados, Moreno-Torroba, Satie, Brouwer etc). 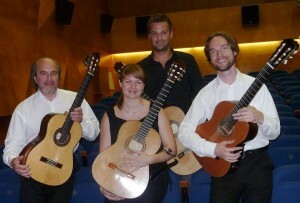 TGQ is devoted to expand the traditional guitar quartet repertoire by playing their own arrangements. They have performed premiere and made audio and video recordings of numerous pieces by Estonian composers (Robert Jürjendal, Tõnu Kõrvits and Timo Steiner). Want to invite us to play?